The complexities of molding a panel which is essentially carpet on top of cardboard without destroying it was not very fun. Nor was it easy, but here at Password:JDM, we were still able to get this completed with the processes that we have developed in house. All of this was done in less than a week. The agenda was to produce a piece thats adds volumes in terms of looks to 2013+ Scion FR-S / Subaru BRZ / Toyota FT86 and keep everything very tasteful. I honestly say it was mission accomplished here at Password:JDM. 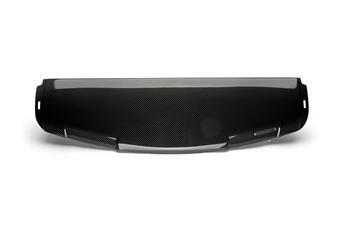 The Password:JDM Dry Carbon Fiber Rear deck Shelf for the 2013+ Scion FR-S / Subaru BRZ is truly a work of art. This is the one interior piece thats most visible from the exterior. Stand anywhere near the rear of the vehicle, and the Password:JDM Dry Carbon Fiber Rear Speaker Shelf demands your attention. Note: The Type I rear deck shelf deletes the OEM rear third brake light.